Since the beginning of the twentieth century, cancer rates have increased exponentially--now affecting almost 50 percent of the American population. Conventional treatment continues to rely on chemotherapy, surgery, and radiation to attack cancer cells. Yet research has repeatedly shown that 95 percent of cancer cases are directly linked to diet and lifestyle. 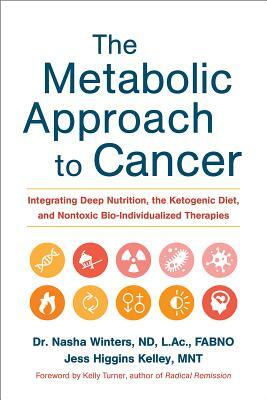 The Metabolic Approach to Cancer is the book we have been waiting for--it offers an innovative, metabolic-focused nutrition protocol that actually works. Naturopathic, integrative oncologist and cancer survivor Dr. Nasha Winters and nutrition therapist Jess Higgins Kelley have identified the ten key elements of a person's "terrain" (think of it as a topographical map of our body) that are crucial to preventing and managing cancer. Each of the terrain ten elements--including epigenetics, the microbiome, the immune system, toxin exposures, and blood sugar balance--is illuminated as it relates to the cancer process, then given a heavily researched and tested, non-toxic and metabolic, focused nutrition prescription. The metabolic theory of cancer--that cancer is fueled by high carbohydrate diets, not "bad" genetics--was introduced by Nobel Prize-laureate and scientist Otto Warburg in 1931. It has been largely disregarded by conventional oncology ever since. But this theory is resurging as a result of research showing incredible clinical outcomes when cancer cells are deprived of their primary fuel source (glucose). The ketogenic diet--which relies on the body's production of ketones as fuel--is the centerpiece of The Metabolic Approach to Cancer. Further, Winters and Kelley explain how to harness the anticancer potential of phytonutrients abundant in low-glycemic plant and animal foods to address the 10 hallmarks of cancer--an approach Western medicine does with drug based therapies. Their optimized, genetically-tuned diet shuns grains, legumes, sugar, genetically modified foods, pesticides, and synthetic ingredients while emphasizing whole, wild, local, organic, fermented, heirloom, and low-glycemic foods and herbs. Other components of their approach include harm-reductive herbal therapies like mistletoe (considered the original immunotherapy and common in European cancer care centers) and cannabinoids (which shrink tumors and increase quality of life, yet are illegal in more than half of the United States). Through addressing the ten root causes of cancer and approaching the disease from a nutrition-focused standpoint, we can slow cancer's endemic spread and live optimized lives.